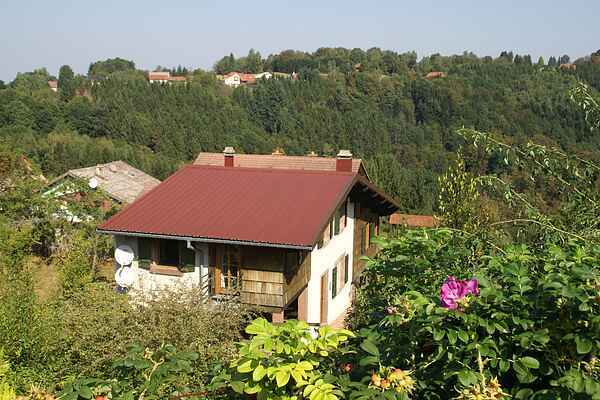 Lovely vacation home in the small, quiet hamlet of Harreberg at the edge of a pine forest. It is gorgeously situated on a quiet hill and from the highest point of the grounds you have a commanding view, it is also the perfect starting point for daytrips with the car or hikes. Interesting attractions in the area are the Rocher de Dabo (11 km) with a little chapel on top as well as a magnificent view, the Plan Incliné at St. Louis Arzviller (9 km) and the caves of St. Léon at Walscheid (6 km). In Rhodes (37 km) there's a zoo and at Langatte (22 km) there is a large lake Etang du Stock where you can fish, rent a pedal boat and go swimming. There's even a waterslide for the children. Supermarket, swimming pool and golf course in Sarrebourg, restaurant in Sitifort (2 km). Bakery at 200 m. But if you want to please the children. Then you head to Europark in Germany (80 km, large theme park) The exciting towns of Nancy (99 km) and Strasbourg (73 km), perfect for shopping, are just an hours drive away.